1. The fresh stalls in the supermarket usually have a layer of 50~100mm piece of ice on the bottom, and then a circle of ice walls with a height of 50~100mm is built around the booth. The process of stacking ice can be observed: The Supermarket Chains Flake Ice Machine must be relatively dry. Since most of the ice storages in the supermarket are not equipped with a cooling and cooling system, the flakes cannot be stored in the ice storage for too long, otherwise the flakes will easily agglomerate and the flakes will melt faster. Non-human consumption, which requires the continuous ice production capacity of the flake ice machine must be strong, the performance of the flake ice machine must be very stable. 2, the space in the supermarket is the size of the inch of gold, so the supermarket usually used the unit will be more in the form of a split, the form of the split is also diverse, which increases the procurement cost in a certain layer, The body usually needs to increase the number of copper pipes, cables, labor costs, and the non-environmental loss of the unit should also increase. 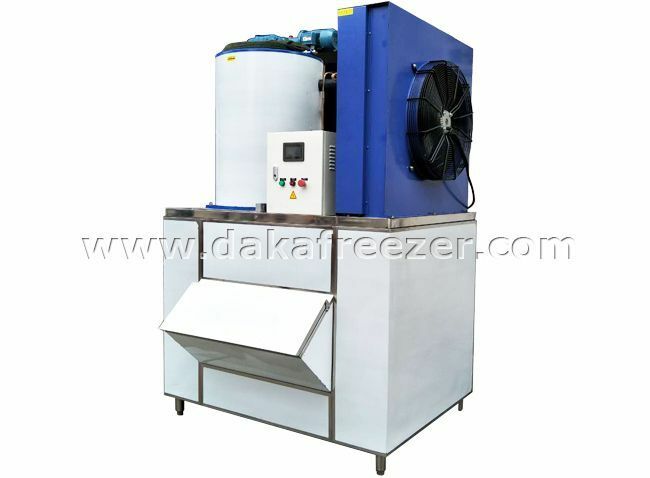 The output of the flake ice is usually affected, and the power consumption of the unit is generally improved. 3, the supermarket's business hours are usually 7:00 ~ 22:00, which requires the machine from Supermarket Chains Flake Ice Machine Supplier usually have to run 3 ~ 4H early, store a certain amount of ice, in the normal business hours of the supermarket, the flake ice unit also needs normal operation, constantly Replenishing the consumption of flake ice requires a high degree of accuracy in the stability of the flake unit refrigeration system and the automation system. Nowadays, most of the ice unit refrigeration system has a high stability level. The automation system usually adopts PLC control. If the automatic system has deviation, it must be maintained by professional or supplier technicians. The maintenance period is too long. Affect the normal business of supermarket fresh.